As I was making the solo 3-hour-drive home from my daughter’s new apartment, my mind was exploding like fire crackers. I was thinking of all the things I had been praying for and actually organizing my thoughts to start my petitions during this one-on-one time with Him. My job and all the issues there. Kiersten’s new job and new apartment. Morgan’s current job, future plans and upcoming test. My uncle in hospice care. A friend’s long road to recovery. And many other prayer requests to which I had been honored to commit to pray for others. And then I got tears in my eyes. I drove in awe, looking at the beautiful sunset and the green rolling fields and just a small twinge of leaves starting to show their fall colors. And slowly the tear rolled down my cheek as I felt the overwhelming presence of the Lord in that Chevy Silverado with me. As I was preparing my list of “will you’s”, I realized that I had so many of those prayers already answered. For some I had uttered a short “thank you” to God. For others I forgot. I began feeling like a little spoiled child who asks for something, expects it, gets it and doesn’t say thank you. As the warm, salty tears ran down my face and onto my speaking lips, I continued for miles thanking God for all of those answered prayers. A new attitude for my job even though the real situation hadn’t changed. The perfect job and location for Kiersten’s first job as a licensed physical therapist. The strength Morgan had received to get through some difficult times at her job. The absolute miraculous healing of my father-in-law. The fact my uncle had received a placement so quickly in hospice care. The unprecedented fall weather and successful start to harvest. The opportunity to get to do what I love by speaking to groups to encourage others in Christ. And another absolute miracle of recovery for our friend, Tom. There is much much more that I thanked Him for but that time alone with Him wasn’t designed for me to GET to pray but rather for the Lord to get me one-on-one to give me peace in the midst of the storms and realize that He had been steering this ship to shore the entire time. 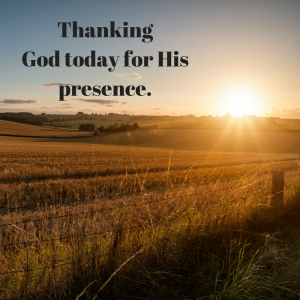 Look around at your answered prayers today and just take two minutes to thank Him and ask Him to make His presence known. No requests. Just thankfulness and unveiling of His miraculous power in answered prayers. This entry was posted in devotional, inspirational, motivational, spiritual on October 4, 2017 by Deanna Young.